…if it wasn’t, you wouldn’t be alive. Think about it. The Master and Creator of the entire Universe (who existed before and will exist after His creation) CHOSE to keep His creation alive. Because God loves you more than you can comprehend, you are not only breathing right now, but when you stop breathing, you have the awesome privilege of living for eternity in His presence. 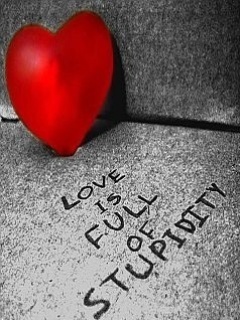 That’s a stupid kind of love. I mean, honestly. We are wretched individuals: we sin and purposely turn from God on a regular basis (even when we try our best to walk righteously). That’s because our best is never going to come anywhere near His perfection, but yet and still, He love us. Stupid. I for one am thankful for God’s love! As foolish as it seems that He chooses to love me each day, I embrace that love as best I can because without it, I would be dry bones. And when I think of His love, and how silly it is, I question my own views of love and relationships here on Earth. This week marks four years of singleness. That means no significant dates, no long relationships, no butterflies. I realized that I had constructed some very air-tight and sturdy walls around my heart over these past four years, and only now that I see they exist can I allow the Holy Spirit to start breaking them down brick by brick. I created these walls because I started believing the lie that love should never make you look foolish or less than perfect. I honestly thought that the only perfect relationship was the one with no drama upfront. Seriously? Every other aspect of life has dramatic elements to it, which don’t necessarily constitute bad experiences. Also, some of the BEST “how we met” stories include flare, excitement, mystery, doubt, and one or both people letting down their walls and chasing after the love they realize they can’t live without. I am talking about real people here, too; not movie plots. Love and relationships require effort and work, but more importantly, they require each person who wants to obtain a lasting relationship to accept the fact that he or she might not look pretty during the process. I’ve been trying to look pretty. So, as I pondered these thoughts God reminded me of His love, and how utterly foolish He looks for loving a being that doesn’t even have the capacity to love Him back in the way He deserves. Fortunately, with human relationships, we can find someone who loves us the way we love them. It’s simply going to take some work, and some rethinking. I am ready to look stupid for love. I’m so glad you’re ready!